Inside: Do you experience fear of the future? Don’t let fear paralyze you! 3 ways to live in the present so you can calm your fear. Last Sunday, I celebrated the 11-year-old’s first communion, then zipped to a bridal shower of a young, godly woman. Before the afternoon was over, a loved one in the extended family had passed from this life to his heavenly home. The full circle of life had played out all in one day — joy, laughter, tears — and yet it was all good, with each event tenderly wrapped in God’s sweet love. The middle-aged son had driven 10 hours and made it in time for final goodbyes, a spark of recognition evident on his father’s face. The young bride-to-be smiled radiantly, knowing she was in the center of God’s will. The middle schooler beamed with pride as she received the bread and the wine, the Holy Spirit working so vibrantly in her life. Jesus’ love wove through each thread of the tapestry, winding its way into hearts and lives, all of it grounded in a God who never shifts or changes, whose faithfulness is sure from generation to generation. I found myself taking in each event unto itself — fully present, aware of God’s mercy and provision. It is here that we find ourselves today, looking at how living in God’s presence in the present calms our fears as we navigate the treacherous mountain roads and the challenging valleys of life. 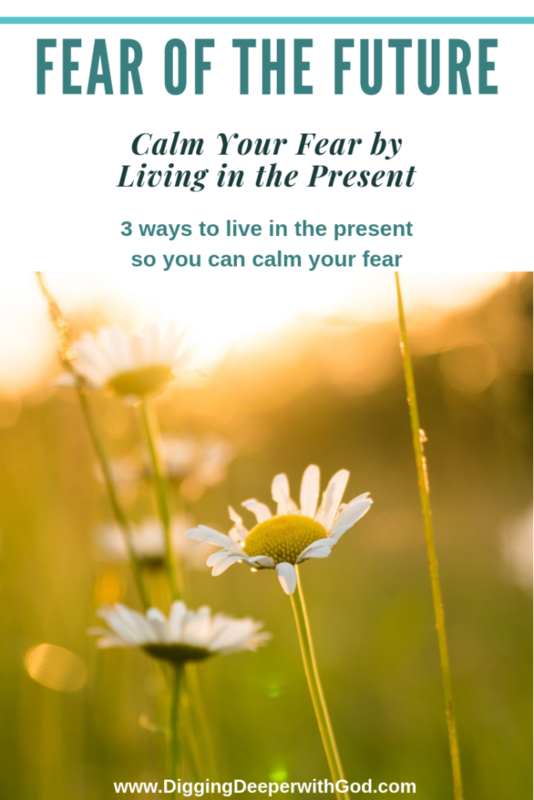 Living in the present — truly immersing yourself in the here and now — can wipe away your fears. How can this be? When our focus is on the now and not on tomorrow or any other thing than the very present, it opens us to walk with Jesus in the most intimate of ways, and when we are in His presence, nothing else much matters. Do you see Him? Close your eyes and take in the picture. For me, we are strolling hand-in-hand in a green meadow sprinkled with daisies. My heart is light and my countenance carefree. When I am with Jesus, He is all I am thinking of, and the cares of the world glide off my shoulders and are left on the path behind me, not weighing me down anymore. I can gaze ahead freely, eager to face the path in front of me, unfettered by cares or concerns. But when I start thinking even just a few hours ahead, or about tomorrow, or about the weeks to come, I start to feel uneasy, unsettled, because tomorrow or any time in the future is unknown and therefore potentially cause for concern! Whether it is the pressing deadlines and uncomfortable to-dos of the next few hours or the uncertainty of a longer term situation, my shoulders tighten with the burden of a backpack filled with rock after rock of problems I cannot solve. Add sand shifting under my feet, and my footing becomes unsteady, my bearings unstable. The fear disconnects me from the Lord. I have let the thief in, and he is stealing my joy, robbing me of my peace (John 10:10). But right here and now? I take a look around. Everybody else in the house is sleeping peacefully. A gentle rain is falling, adding rhythm to my typing. I am clothed and warm, my stomach full. Clothes are laundered, ready to wear tomorrow. 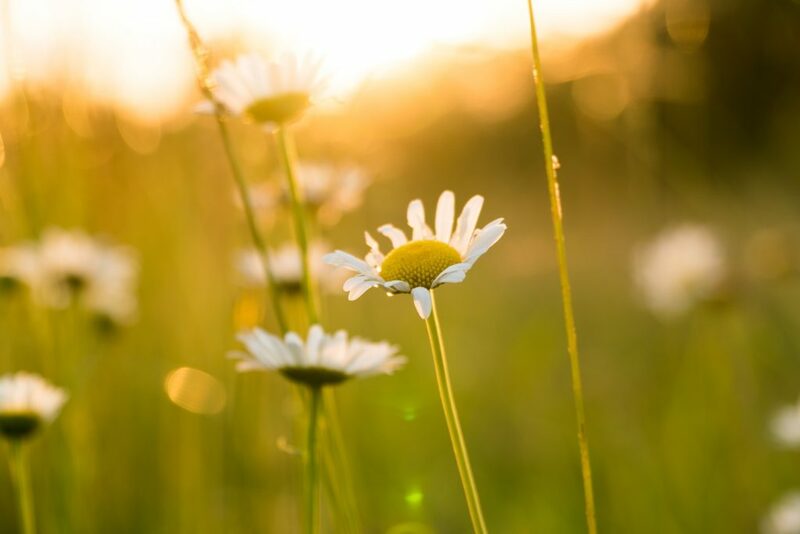 The clutter invades for a moment, and I push it aside, for I am walking in that meadow with Jesus, blue sky overhead, a light breeze, daisies bowing, heart free. Chances are, things are pretty darn good for you today, too. It’s a matter of noticing the present, the very here and now. Take a look around: What do you see, hear, smell, taste, and touch? Are your kids still sleeping or gleefully giggling, awake too soon? Are you nestled under bed covers or sitting peacefully in a special chair or on a cozy couch? Was your coffee warm, your breakfast filling? Did your car get you safe and sound to work, music filling your commute, friendly faces greeting you at the office? Do you have a job that you generally like despite those rare hard days? What a blessing! See how living in the present allows us to focus on God’s presence . . . and how living in God’s presence allows us to focus on the present? This brings freedom to my mind and spirit! It lets me open my hand and my heart to whatever it is God wants me to receive or do here and now. I would like to experience this every moment of every day. But, alas, I am human! How can we coach ourselves to live in God’s presence, being fully present in the here and now, more often than not? Take a look at Psalm 16, a portion of which is printed for you below. The psalmist uses several strategies to focus on the Lord. When your mind starts spinning to all those things you cannot solve — you know, like how to fix the nagging plumbing problem or the relationship gone awry — turn your mind instead to praise! To bless the Lord means to express gratitude or admiration — to praise Him! Singing or worshiping helps us magnify Jesus and exalt His name, and when we are doing that, our heart is there and not on our fears. Have you ever praised God because of the wise counsel He provided to you? If not, there’s no time like the present! Bow your head, close your eyes, and tell God what’s what in your world! The thing is, He already knows, but He longs to talk with you about your troubles. Then listen for His counsel for a few moments, across several hours, or over the next few days. Let your mind linger with Jesus so He can fill your heart with His warmth and your mind with His ideas. Bless the Lord for His counsel, for all that He leads you to see and understand! This all sounds fine and dandy, until the crisis small or big hits. You planned to serve spaghetti for supper and discover too late that you don’t have spaghetti sauce! Or you sit stunned after the phone call delivering the bad news. It is not true that you don’t know where to turn. So at that very moment, bring the Lord to mind, and as the psalmist says, figuratively set the Lord before you. Look at the strength God promises: You shall not be shaken! In His presence, you will find peace from your fears. We are going to (1) bless the Lord and listen for His counsel, and we are going to (2) set the Lord before us — that is, bring Him to mind both in the midst of our ordinary daily walk or when in crisis. Did you see the result of God’s presence in verse 14? When we are in God’s presence, we have REST! Rest from your aching heart, rest from your relational difficulties, rest from your parenting challenges, rest from your fears of the future. Rest. How very interesting that when Moses asked God to show him His ways, God answered by promising His presence. That is all we need. What fear of the future are you facing? How can you live in Jesus’ presence today? Spend time now or throughout the week contemplating these questions. I really encourage you to write out your thoughts to Jesus, even if you do it in an abbreviated way. I often write bullet points but pray more extensively in my mind. Having paper and pen handy allows me to write down what God brings to mind as I talk with Him. 1. Read and meditate on Psalm 16. Take note of what God impresses on your heart as you read this passage. Verses 7 to 11 are printed for you here. Remember, “The thief comes only to steal and kill and destroy. 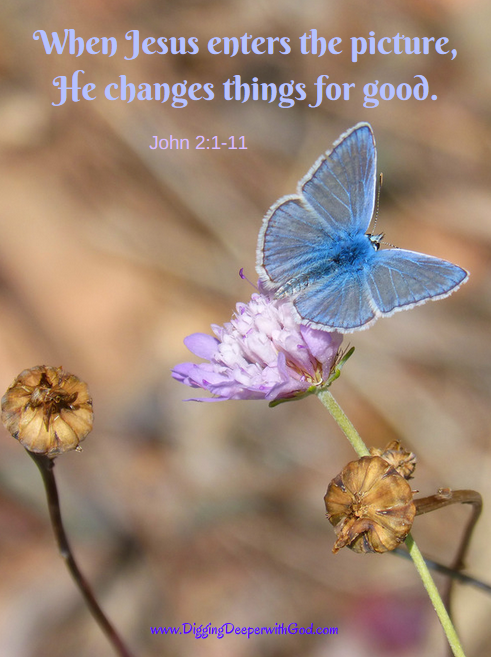 I came that they may have life and have it abundantly” (John 10:10 ESV). Jesus so wants you to have an abundant life, and that primarily happens in His presence! 4. If you like to do Bible art journaling, find the phrase you chose in question 3 in your Bible and color this verse or a picture of it in the margin of your Bible. You could also make a bookmark with the verse or phrase on it! There’s nothing like praise to bring you into the presence of the Lord and wipe away your fear! Sing, dance, or hum these song!